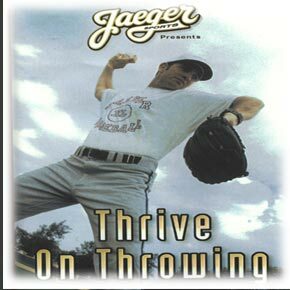 "Thrive on Throwing" is a must for anyone who is serious about playing Baseball or Softball. "Your arm should be something that completes you as a player rather than something that you try to hide." The health and longevity of your arm is your lifeline as a ball player. There's no other way around it. This video will take you through every step of Alan Jaeger's innovative Arm, Health, Strength and Conditioning Program. It will teach you how to strengthen your arm by developing the smaller muscles (rotator cuff) in your shoulder, which are the most vulnerable to injury. Through "arm circles" and a systematic surgical tubing exercise program the shoulder muscles gain greater range of motion, balance, endurance and stability. It will also teach you how to solidify your mechanics so they become supportive, efficient and consistent through Long Toss. throwing is a lost art. Throwing isn't something that we should do "just" to get our arms loose. Throwing should be done to maximize that skill, to develop it like any other skill; to be a strength rather than a potential career threatening weakness. There isn't any reason why a player should have a chronically sore, weak, or injury prone arm. If the arm would get the same kind of attention that our hitting, defense or pitching gets than it too would have a chance to thrive on a daily basis. Unfortunately, most baseball players neglect their arms or take them for granted.